Pre-teach renewable and non-renewable energy resource content. The worksheet provided in the development section makes a reference to data from the year 2004; however, the data have been updated since then so the teacher should edit this question. Some of the questions on the e-sheets may require vocabulary assistance (i.e. sector BTU). Teachers should reinforce the concept that energy is measurable and quantifiable. Students investigate renewable and non-renewable energy sources in their states and in different regions of the country through the State Energy Profiles on the Energy Information Administration (EIA) website. These sources include ten major sources of energyâsolar, wind, geothermal, biomass, hydro, petroleum, natural gas, coal, and nuclear. The activity utilizes authentic data. Map data is updated periodically, as state energy profiles are changing. 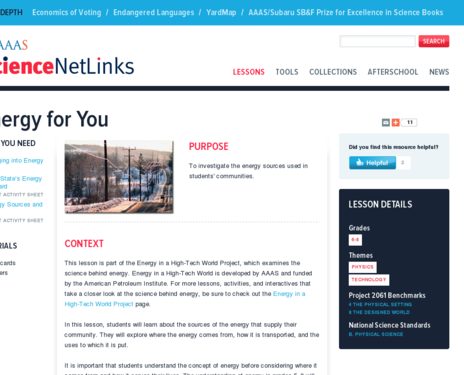 Context section discusses many misconceptions students have about energy. Links are provided to resources that could be used to teach prerequisite science knowledge. Comments from expert scientist: The most interesting part of this lesson is its use of the US Energy Information Administration as part of its lesson activity. There is a wealth of information there that could be very interesting to students and can easily be localized for relevance. The main point in the initial lesson is the categorization of energy sources into renewable, non-renewable, and secondary. This teacher guide provides sections on motivation, development, and assessment. The EIA State Energy Profiles provide maps, updates, quick facts and data for each state. Note that the energy profiles of states are changing over time. Be sure to access the most current information. Links to extension activities are provided. Well-constructed worksheets for students to record their learning. Some students may need additional guidance to pull out key information about their state. During the "development" activity, students may need teacher assistance in "decoding" the map of their state and what all the symbols mean; there is a great deal of information provided all at once, which could be overwhelming for some students. All of the material is available in printable form. This activity has a clearly written lesson plan/teacher's guide. Map symbols are color coded and may be difficult to interpret for those who are color blind.